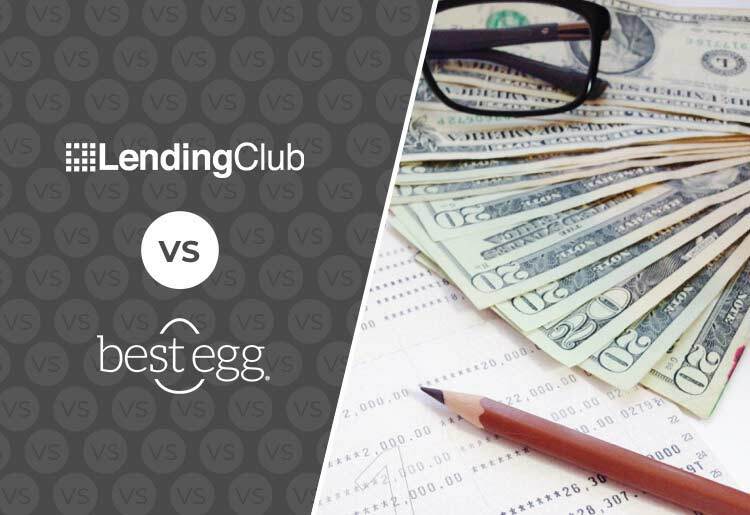 Best Egg vs LendingClub: Which Personal Loan Company is Best? In a world where financial crisis is a commonly-used term, knowing a good lender can make the difference to someone struggling with their own financial situation. Looking at the stats, reviews, and numbers, it's obvious that LendingClub and Best Egg are 2 of the top options for taking out personal loans. Of course, each one has its strengths and its weaknesses. LendingClub offers a wider range of loan amounts, has a tremendous network of lenders, and will work with just about anyone regardless of credit score. It isn’t available in every state though, and has been known to take up to 7 business days to transfer the money once the loan has been approved. Best Egg, on the other hand, is backed exclusively by large financial institutions and secures your loans via the FDIC. It also has a wonderfully fast turnaround time. However, Best Egg has a higher minimum loan requirement in some states—Ohio, Georgia, and Massachusetts, for example—and isn’t always clear about loan terms. Both of these lenders have a lot to offer the typical borrower looking for a solid loan. So, which lender should you choose? Here’s a head-to-head comparison of LendingClub and Best Egg, so you can see which one will work best for you. To begin with, LendingClub works with exceptionally low credit scores. In fact, you can get a loan with this lender sporting a credit score as low as 600. What’s even more impressive is that it offers joint application loans, which let you apply for the loan with a second party, a sort of co-signer if you will. As long as the second party has a credit score of 600 or higher, you can apply with a score of as low as 540. This is extremely encouraging for people who have really poor credit and have been rejected many times before. Understand that this type of loan will come with the highest interest rates available, but it’s a worthwhile price if you cannot get approved elsewhere. Additionally, Best Egg is a little vague about its loan requirements altogether. While LendingClub states clearly on its website what you’ll need in order to qualify, Best Egg leaves you guessing. The advantage of working with lenders that have a large network of financial donors backing them is that you don’t have to worry about a lot of upfront fees and costs. Both Best Egg and LendingClub charge no application fee. However, you will be charged an origination fee of approximately 1%-6% of the loan amount. This comes off of the loan amount being deposited, so take this fee into consideration when you are making your total loan amount request calculations. Best Egg states on its website that any 60-month loans will have a minimum 4.99% origination fee charged. That’s a bummer. Best Egg also charges a $7 processing fee per payment if you’re not enrolled in the auto payment program. It’s not a huge fee, but it does put LendingClub ahead by a smidgen. Both LendingClub and Best Egg offer the same repayment terms. You can choose between a 36-month repayment plan (that’s 3 years) or a 60-month repayment plan (5 years). They both charge a $15 late payment fee, as well. What separates the 2 lenders though, is LendingClub’s repayment freeze feature. If you fall into one of the LendingClub’s Hardship Plan situations, this lender will freeze your loan for 3 months. That means you won’t have to make loan payments for up to 3 months. Hardship Plan situations include getting fired from your job, being hospitalized, or some other similar occurrence. The Hardship Plan is not only a huge relief for any borrower who has been struck with a difficult situation, but it also shows real compassion and humanity on the side of LendingClub, traits that are so comforting for most borrowers and rarely seen on the finance scene. The application process for both companies is pretty much the same. They both offer convenient online forms that you can fill out in about 2 minutes. You’ll be asked standard personal details such as email address, telephone number, and living arrangements. You’ll also be asked about annual income (individual and household), employment history, and the status of your home ownership. Best Egg offers pre-approval though, something that makes the entire process from application to deposit potentially much faster. In fact, you can be given an answer on the spot as to whether or not you will get approved for a loan. This can not only take a lot of the anxiety out of waiting for an answer, but it will also save you time so you can move on to another lender if you’re not approved for your loan. Customer service is an important element for most people dealing with financial difficulties. Best Egg has a great reputation for customer support with a 9.5/10 rating on Trustpilot and close to 90% of customers rating it as excellent. You can reach customer service on the phone from Monday–Thursday 8am-11pm ET, Friday 8am–8pm ET and Saturday 9am–1pm ET. LendingClub also has customer service available Monday to Friday 6am to 5pm Pacific Standard Time, and on Saturdays from 8am to 5pm Pacific Time. Both companies have FAQ sections, but the LendingClub’s resource center is a bit more exhaustive, giving you all of the answers to any question you might have, all neatly organized for easy locating. At the end of the day, whether you choose Best Egg or LendingClub, you are dealing with a solid, reliable, and quality lender. Best Egg really goes the extra mile providing pre-approval for nervous borrowers anxious to hear an answer. Of course, if you can wait for an answer, LendingClub will deliver great service with tons of flexibility and extensive information at every turn. The 2 areas that LendingClub really pulls ahead of everyone else though is with the Hardship Plan and low credit acceptance. The Hardship Plan makes repayments less stressful and easier to handle, knowing you won’t be burdened with one more thing during a difficult time in your life. And the fact that LendingClub works with people who have credit as low as 540 (with joint application) gives hope that even someone with really poor credit can get approved for a loan if they need it. For these reasons, LendingClub wins our head-to-head comparison, but you’re in good hands no matter which one you choose.